A busy 2016 – and it’s barely begun! If that old saying is true – that “idleness is the devil’s playground” – then I suspect Satan has probably left the building. Although I had some enjoyable downtime with the family over the holidays, I can’t say I was relishing in any sort of ‘idleness’…and with the new year upon us, things are just getting busier! The 10th annual CYBILS Awards (aka, the Children’s and Young Adult Literary Bloggers Awards) are underway, and as a first-round panelist for the graphic novels category, I had my work cut out for me. My fellow panelists and I had to pore over 102 nominated books to nail down the 14 that we felt were the best! The graphic novels category is an interesting one, because of a number of reasons. First, it’s divided into two sub-categories: Young Adult and Elementary/Middle Grade – which means we are reading for different age levels. Second, it’s not just fiction; there was non-fiction, historical fiction, even memoirs! It was tough to sort through them all, but a lot of fun, and quite a learning experience. In past years, I’ve been a judge for the Poetry category – but since I was a contributor to three of the nominated anthologies, I had to step aside. I am extremely proud of the fact that one of those anthologies, the National Geographic Book of Nature Poetry (National Geographic Kids, 2015) is a 2nd-round finalist, so my fingers are crossed! You can see the list of all the finalists for all of the categories HERE. In addition to the children’s poetry anthologies I contributed to this past year, I will also have a poem included in former U.S. Children’s Poet Laureate Kenn Nesbitt’s new anthology, One Minute Til Bedtime (Little, Brown Book for Young Readers, Spring 2016). I’m also thrilled to announce that I will have two poems in two separate anthologies yet to be announced! I wish I could tell you more about them, but cannot…at least, not yet, anyway. In fact, one isn’t due to come out until 2018 (tentatively), so you’ll be hearing plenty more about it in the months (and years!) ahead! I’ve been busy cranking out manuscripts this past year and am now sending them out in hopes of finding an editor or agent interested in acquiring them. If my numbers are right, I wrote or revised 13 manuscripts over the course of 2015 – some brand-new, others revised – and they are all looking for homes. Most are picture books, but two are children’s poetry collections. One was a rhyming picture book collaboration with one of the nicest and most talented and prolific children’s poets in the country, for which I’m honored. It’s my sincere hope that the manuscript gets picked up – not simply because I am a children’s writer looking for a contract, but more importantly because I want our collaborative effort to be validated as a worthwhile effort for my partner, who took a chance on me. Three magic words: New. Voiceover. Studio! We recently wrapped up $20,000 worth of construction work on our house (most of which insurance paid for, thankfully! ), but one of the things that came out of this was a rearranging of our rooms. My wife and my master bedroom had to be vacated and will soon become our 2-year-old daughter’s new room, while we had to move downstairs to what had been a playroom/storage room for the kids. The benefit of this is that the nursery in which our daughter sleeps now – a fairly small room, by any standard – will become my new studio! I’m looking forward to treating the room for acoustics, sound-dampening, organizing, etc. – but first we need to get walls painted and beds situated before any of that can happen. Oh, 2016 is going to be a good year, indeed. Last but not least, the 2016 NE-SCBWI Conference! The New England chapter of the Society of Children’s Book Writers and Illustrators (SCBWI) is hosting its annual spring conference at the end of April, and I’m already packing! Why? Well, because it’s always packed with insightful panels, intriguing keynotes (Jane Yolen, Tomie dePaola, and Kwame Alexander, to name a few), educational workshops, and tremendous networking opportunities. But beyond all of that, this year is special to me because I’ll be involved in two new ways: as a volunteer and as faculty! After a brief overview of what free verse is and how to utilize it, attendees will be able to practice with some on-the-spot writing and ask questions. My desire is that this workshop will be beneficial for writers who just want to be more creative as well as for those who wish to write in a more poetic or lyrical style…and it could be a great primer for writing verse novels, which are often written in free verse. I’m also helping to coordinate our Open Mic programs Fri. and Sat. nights, together with fellow writer Sharon Abra Hanen. Attendees are encouraged to share what they’re working on – children’s poetry, a picture book manuscript, even a few sample pages from a book – with the crowd. And new this year, a special feature called “Whose Rhyme Is It, Anyway?”- a quick, improvisational flash-poetry game where two writers (or teams) will be given random words and subjects and will need to create a children’s poem within the allotted time. Get more details about the conference HERE, and if you’re a member of NE-SCBWI, I hope to see you there! Well, for now, it is. I need to write two more poems, but they will have to wait. One is for Penny Parker Klosterman’s blog (my kids and I will be featured on January 29), and one is for my chiropractor, Dr. Stephanie Foisy Mills, D.C., C.C.W.P., who asked if I’d mind writing something for her blog. I also have two more picture book manuscripts and three children’s poetry collections I need to work on…but one can only do so much. Please stay in touch – either through this blog or via any of my social media homes listed below – and I wish you health, happiness, and all wonderful things for this brand-new year! They say a picture is worth a thousand words. So if you’re wondering why I haven’t posted anything new on Tuesdays for the past couple weeks…let me show you! 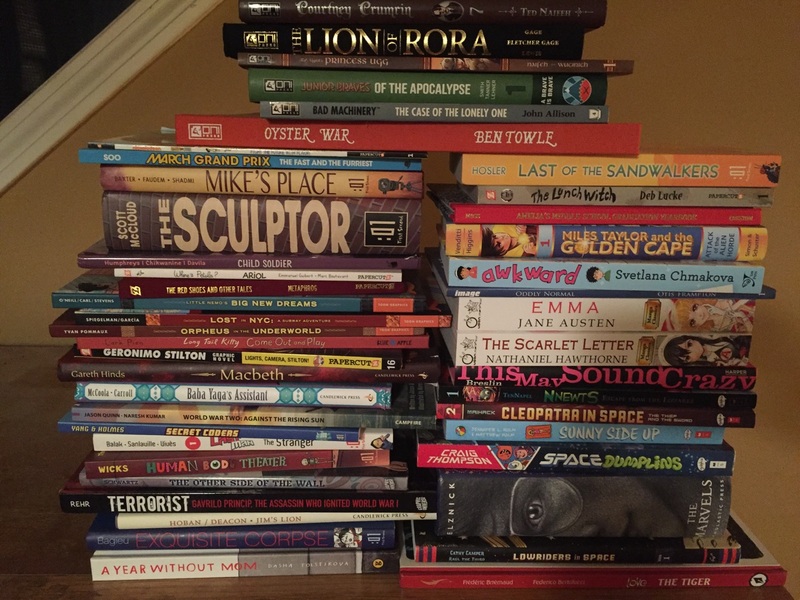 These are just SOME of the 102 graphic novels nominated for the Elementary-Middle Grade Graphic Novel and Young Adult Graphic Novel categories in the 2015 CYBILS Awards. That’s a lot of reading, right there. This is the first year I’ve been a first-round panelist; the past two years, I’ve been a second-round judge in the Poetry category and have only had to sort through 7 books. A proverbial walk in the park, compared to this! But I’m enjoying it. One thing that has surprised me is how the definition of “graphic novel” has changed over the years. Graphic novels used to be, for all intents and purposes, highly-produced comic books in traditional book form. These days, any book that utilizes illustrations to tell a significant portion of the story can qualify. Whether or not that definition holds true for each of these books is a question only those of us judging them can answer – and I’m slowly working my way through the pile, taking note of what I like and what doesn’t work. The variety of styles, narratives, formatting, and age ranges is amazing, though, and it’s going to be difficult paring this massive list down to just a handful of titles to pass along to this year’s second round judges! Having wrapped up a revision of a poetry collection I’ve been working on for a couple years AND having completed another collection I started compiling this summer, I also just put the finishing touches on a new picture book manuscript. You know what that means: time to write another! That’s what I’m doing now, in addition to finding some appropriate publishers to send the completed manuscripts to. There are only so many hours in a day, as they say, and with our 2-year-old rarely taking naps anymore, the days’ hours are even more precious! I’ve also been a bit slower than normal, thanks to that 2-year-old daughter I made reference to earlier. Last week, as I was reaching over her car seat to find a necklace she lost, she suddenly grabbed her older brother’s Teenage Mutant Ninja Turtle toy and jammed it as hard as she could into my left eyeball. As you can see, the injury severely affected my eyesight as well as other facial features. When I stopped screaming, I found enough composure to call the local Urgent Care facility to see if they could fit me in. It didn’t appear that my eyesight had been damaged, but infection was certainly a possibility and the pain would fluctuate between a 1 and a 5, so I needed something to get it to stop tearing. The offending item, a sai (pron. “say”) which my daughter wielded expertly. A little TOO expertly. His smile came over the phone clearly. “More than you can imagine,” he said. I now know why Popeye squinted his eye that way – Sweet Pee probably smacked him in the face with a can of spinach and the poor old sailor man never fully recovered. So now that I can see without pain and without the weird, scrunched-up eye thing I was doing for a few days, I can focus (pun intended) on Thanksgiving! There’s a turkey to brine, desserts to make, and bread dough to rise. My wife and I are also trying out a vegan butternut squash lasagna for the first time, so I’m looking forward to that, as well. I hope you have an enjoyable week! If you celebrate Thanksgiving, I hope it’s wonderful for you…and if you don’t, perhaps you’ll find some time to reflect on all the positives in your life. Personally, I’m thankful for my family, my health, my faith, my talents, and all the tremendous blessings I enjoy. Many of these blessings, like the books I’ve been able to be a part of, you are part of! For that, I thank you. By the way, you only have about one week left to get your “Poetry…Cubed!” poems in – and if you don’t know what I’m talking about, click HERE to get caught up-to-date! As for me…I have some reading to do! 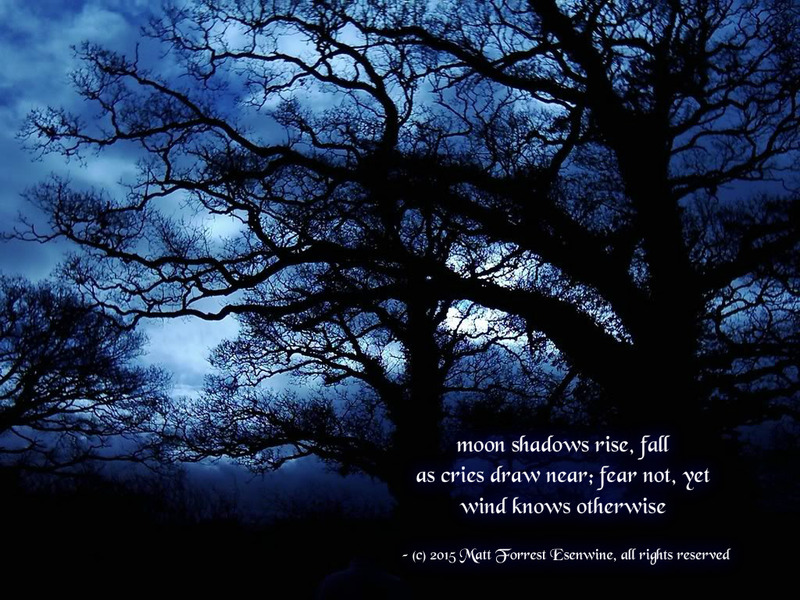 Is there such a thing as a Halloween haiku? Hmmm…not sure. But why not?? I know, it’s still a bit early for Halloween – or is it? I was going to hold off on sharing this until later in the month, but then I realized there are only 3 weeks left until Halloween…so I’m not waiting any longer! By the way, there are only 6 days left to get your nominations in for the 10th annual CYBILS Awards! For more details on my role with the CYBILS, check out this past Tuesday’s post, and to nominate your favorite children’s book, click HERE. 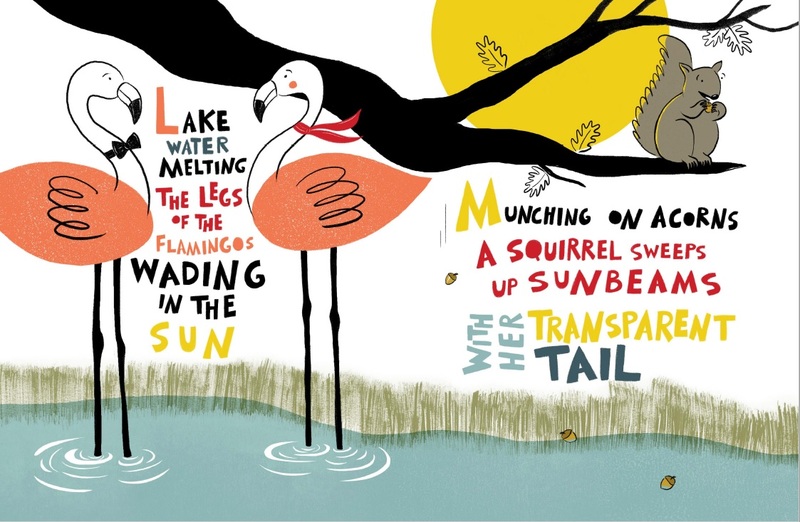 And for all of today’s Poetry Friday fun, links, and hi-jinx, be sure to visit Laura Purdie Salas at Writing the World for Kids! The 10th Annual CYBILS Awards are back! Hard to believe, but nominations for the TENTH annual CYBILS Awards are now open! Every fall, the CYBILS – an acronym for Children’s and Young Adult Bloggers Literary Awards – begins accepting nominations of books that readers, authors, agents, and publishers feel are the best of the year. And for the third year in a row, I’m very honored to be one of the judges! Two years ago, I was a second-round judge in the Poetry category. As such, I worked with a handful of other judges to sort through 7 books that had been pared down from nearly two dozen that the first-round panelists had deliberated. Ultimately, Amy Ludwig VanDerwater’s Forest Has a Song (Clarion, 2013) nabbed the top spot. Then last year, I returned to my role, and along with the other second-round judges managed to nail down a winner, Jacqueline Woodson’s Brown Girl Dreaming (Nancy Paulsen Books, 2014). This was a tough decision, because it was the first time verse novels were included in the Poetry category – up til then, collections and anthologies had a nearly exclusive lock on the category. This time around, we had three novels from which to choose! From what I hear, there are even more verse novels this year – which should make the judging even more difficult. It’s my hope that eventually verse novels get their own category because it’s extremely difficult comparing a book of poems for 7- or 8-year-olds like Jon J. Muth’s Hi, Koo! A Year of Seasons (Scholastic, 2014) with Kwame Alexander’s The Crossover (HMH Books for Young Readers, 2014). Oh, and the reason I say “from what I hear” is because I will not be involved with the Poetry category in any way this time around…this year, I am a first-round panelist for the Graphic Novel category! As someone who grew up with comic books – and their big, bold graphics – I’m looking forward to expanding my horizons. I’ve read a number of graphic novels but the genre is still fairly new to me, so I’m guessing I was chosen to provide a fresh perspective. I’ve already started reading a couple of nominees and am having a blast. I will miss being a part of the Poetry category, but didn’t feel it would be appropriate to be a part of it, since I have poems in four different anthologies this year, and any one of them – or all of them! – might be nominated. I trust my poetry friends who will be judging will do an admirable job, though. So before the nominations close on October 15, please log on the CYBILS website and nominate your favourite children’s books from this past year! From Middle Grade and YA Fiction to Non-Fiction, Picture Books and Book Apps, I’m sure there is a category you’ll want to nominate a book for. And stay tuned for updates, right here! Wow, it’s been quite a busy week! This past Saturday, Carol Varsalona published her “Summer Splashings Gallery” – a huge collection of poetry and photographs celebrating the season that is winding down. I’m very happy my poem, “Stonewall County Summer,” is included. Please check it out, along with all the others! Then this past Tuesday, I shared some revelations and affirmations from the local state fair, where I wrapped up a live-announcing gig during Labor Day Weekend. 55 hours over 4 days…one can learn a lot during that time, and I did, as I do every year! This beautiful book hits shelves about a month from now, and I couldn’t be happier to be a part of it. This is the fifth and final book of 2015 in which one can find my poetry, and what a great way to wrap up the year! I’m also very excited to be a CYBILS judge once again. This year, I’ll be a first-round judge for the Graphic Novel category, which is a change of pace for me, as I have judged poetry for the past 2 years. I would have loved to have judged poetry again, but was concerned that one or two of the anthologies to which I’ve contributed might get nominated – and I wouldn’t have wanted to create a conflict of interest. A number of quality poetry collections came out this past year, so I’ll be eager to see which ones make the cut! 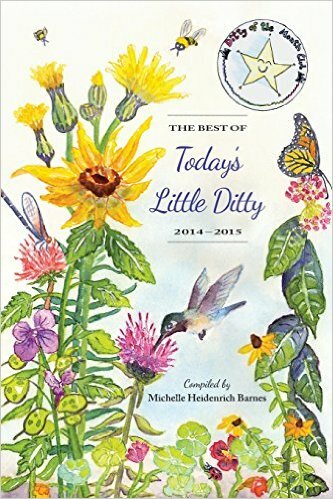 By the way, friend and fellow poet Michelle H. Barnes is hosting Poetry Friday today at Today’s Little Ditty – so stop on by and check out all the poetry links! I write a random poem. I like it, but soon realize there’s a serious error, so I rewrite it. In the course of rewriting it, I write another. Once these are done, it occurs to me I could send them to a magazine, although submitting a third poem to go with the first two would be ideal. I write a third poem, but it’s not about the subject I thought it was going to be. It occurs to me that these three poems, all of the same theme, might be more appropriate if collected together with some previously-written poems in a picture book collection. I wonder if I can write a fourth poem about the same theme. I write a fourth poem. Once I organize all the poems – these and the previously-written ones – into a thematic manuscript, I realize I need more poems to fill it out. I write a fifth poem. Upon adding it to the manuscript, I realize the theme is wrong and have to pull poems out and put new ones in, basically completely revising an previously-compiled, unpublished collection. Satisfied with the theme, I decide to try writing a sixth poem about that theme. I write the sixth poem. At this moment in time, I only need to write three more poems to complete the manuscript. I’m working on one now. The amazing thing to me is that all of this has taken place over the past 4 weeks…so considering the volume of my output this month, either I’m getting much better at writing or I’ve completely lost my ability to self-criticize. I’m hoping it’s the former, as I still feel I’m my own worst critic! But let this be a lesson: Never, ever, ever, lock yourself into the frame of mind that you can’t edit, revise, or rewrite something. Honestly, I’m not a fan of rewriting, as I like the happy, content feeling one gets from lifting up the pen; who doesn’t, right? However, if there is something about the poem or story I’ve written that just doesn’t feel right, I cannot live with myself until I’ve fixed the problem. It might take walking away and coming back to it in a few minutes. Or hours. Or days. One poem literally took me a year and a half to write – but it got written, and written the way it was supposed to be written. Unfortunately for me, it’s one of those types of poems that everyone seems to love but no one knows what to do with. But that’s my problem, not the poem’s. It needed to be written the way it needed to be written. I have a number things I’m very excited to share with you – and all these things are bouncing around inside my head, as well. I’ll have poems in five different anthologies being published this year, and one will be in an upcoming edition of Highlights magazine. Three of the books are due out this spring and one is due this fall. I also have high hopes for a picture book manuscript I wrote this past year. It’s one of those types of things that just came to me; I wrote it over the course of a week, revised the following week, and I do believe it might be the best manuscript I’ve written to date, so we’ll see if it gets picked up! Speaking of said manuscript, it’s the same one that helped me receive the New England SCBWI’s inaugural Marguerite W. Davol Picture Book Critique Scholarship for pre-published authors! 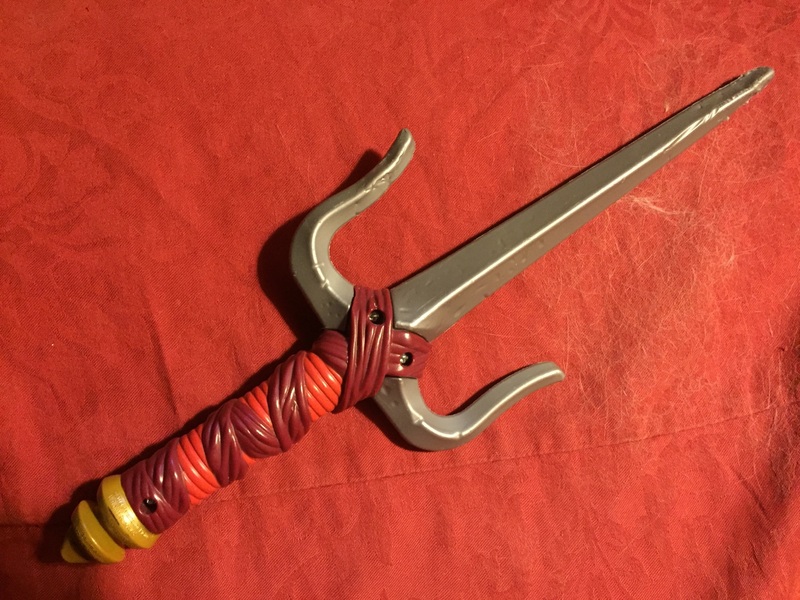 For details on what that is, feel free to check out this past Friday’s post, where I explain it in greater detail. I’m also excited to be a Second Round Judge in The annual CYBILS Awards, where the finalists have been announced! I’ll be working with fellow judges Renee LaTulippe, Linda Baie, Laura Shovan, and Diane Mayr to trim our list of seven fantastic children’s books of poetry down to one winner – and this year it’s going to be a tough one, there are so many great books! Whatever your goals, stick to ’em! I wish you great success for 2015, whether it’s professional or personal. Remember, the act of setting goals, while necessary, is not as important as following through with those goals. It’s the difference between saying you’re going to do something and actually doing it. Whatever it is you want to accomplish, take action and do something each day to move you toward the end result. Some days I don’t get a chance to write, sad to say. I’m a stay-at-home dad with a voiceover business and my hours are precious and few. But there’s not a day that goes by that does not include me either emailing someone about writing, reviewing my own writing, reading an article about writing, or even simply reading a book to my kids. I’ve been writing for what seems like forever, but did not get serious about becoming a children’s writer until 2009. Since then, I have slowly gained traction – improving my skills, networking, and learning the craft. I have met wonderful people, befriended nationally-acclaimed writers and editors, and developed a base of friends and supporters like you through this blog. I appreciate you helping me attain my goal. I hope, by reading this, I can help you attain yours. Success requires both talent and tenacity – one of those in a much higher quantity than the other. Have a Happy New Year, and thank you for being a part of mine! 2015 is getting off to a simultaneously wonderful and frustrating start. After everything my wife and I have been through the past couple months – with boilers blowing and electrical panels needing replacement – I’ve finally gotten some great news! The good news that I’m thrilled to share is that I have received the New England SCBWI’s inaugural Marguerite W. Davol Picture Book Critique Scholarship for pre-published authors! I will receive a critique from author Mary Brigid Barrett and will have an opportunity to revise it prior to submitting it for critique by an agent or editor at the 2015 New England SCBWI conference. I’m also excited to be a Second Round Judge in the CYBILS Awards, where the Poetry Book finalists have been announced! I’ll be working with fellow judges Renee LaTulippe, Linda Baie, Laura Shovan, and Diane Mayr to pick one winner out of seven fantastic children’s books of poetry. …is that we woke up to no heat downstairs on New Year’s Day after one of the pipes burst. Alas, if that was the only issue, it wouldn’t have been that bad; the problem is why it burst. You see, we live in a 100-year-old house that has been added onto and added onto over the years…and apparently, underneath the newest section of the house, there’s no insulation. None. There’s isn’t any barrier of any kind preventing the wind and cold from blowing underneath the house and freezing every pipe it happens upon. The only reason we’ve learned this just now is because usually there’s so much snow up against the house, IT acts as a barricade. But this year, no snow – no barricade. And yes, you read that correctly – the newest part of the house is the part that needs the most work. The older part of the house is in pretty good shape, ironically. So, while my wife & I try to figure out how to pay for yet another extraordinary home expense, I thought I’d work on a new book idea. It’s a revision to a poetry collection I’ve been working on for a couple years, and I think I’ve finally found the “theme” I need to make this manuscript marketable. I’ll tell you more in this coming Tuesday’s post – but for now, here’s my latest poem, which I plan on including in the book. If you have the time, please consider taking a moment and checking out this past Tuesday’s short post about my blog in review – there are some surprising things I learned about what was happening with my blog in 2014! And for all of today’s Poetry Friday links and hijinks, head on over to The Miss Rumphius Effect! reflects upon the ground below. But are we sure that this is so? is what gives moon its midnight glow?